I ordered Arsenicum Album for numerous issues. It is the best for stomach flu. 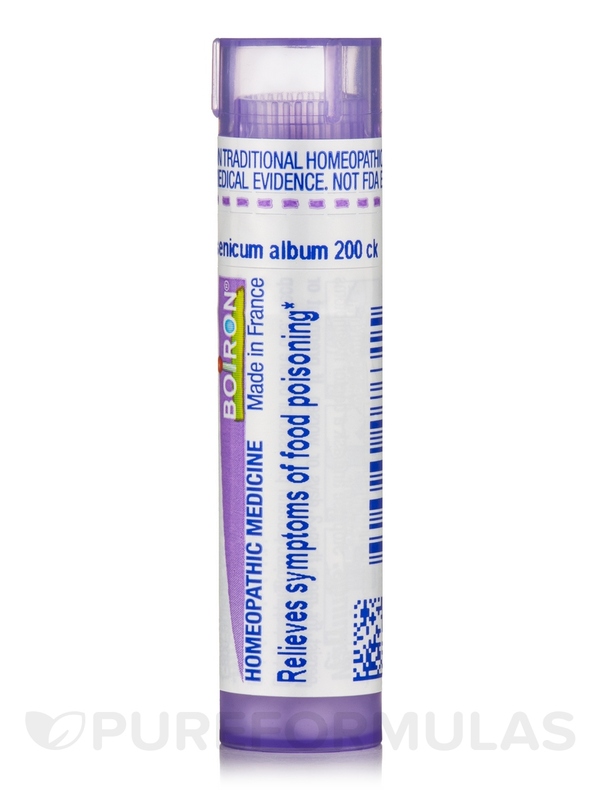 Arsenicum Album by Boiron is a staple in our house for everything from stomachs to skin! Sometimes, with an overload of caffeine, (I love tea and chocolate) , my heart rate gets a little fast and off kilter. An Arsenicum 200 pellet will stop it within several minutes. It is good for many kinds of symptoms. This Arsenica Album 200ck by Boiron helps relieve itching so well for my daughter and husband. My daughter is allergic to grass, her own sweat, and sometimes even water. They all cause mild to medium itching. I give her an Arsenicum 6 or 200 and the itching stops almost immediately! It also helped us all when we got the stomach flu. It helped alleviate the severe stomach cramps and helped us sleep. A college student who helps me with my daughter came to work not knowing she was contagious. The next day she called out sick. Sure enough my daughter and I caught it and all 3 of us were sick. One dose of this Arsenica Album 200ck by Boiron stopped my diarrhea. It is one to keep in your home at all times. Fast and effective with no side effects. I wish all the remedies were available in water amplules for those who are lactose intolerant. 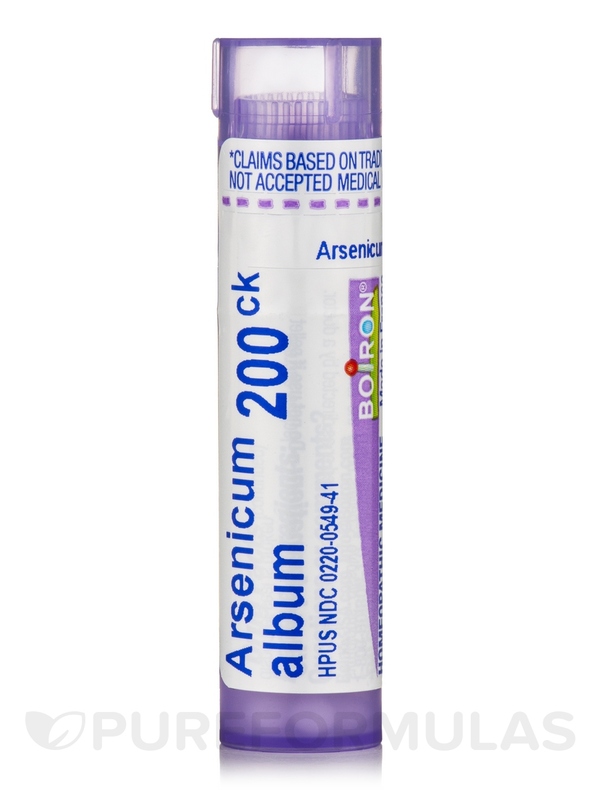 Arsenicum Album 200ck by Boiron has lots of uses in homeopathic treatments. At the first sign of a possible break out (that ache or tingling in the body) I take a dose of Arsenicum Album 200ck by Boiron. I take 3 pellets away from any caffeine or mint like in toothpaste for at least 20-30 minutes or it cancels it out. I also take another dose at night. If I want a back up I take Rhus Tox 200 the next day. Pop some Lysine too as needed. It works!!! Never tried it for food poisoning or stomach flu but will when I need it. Arsenicum Album by Boiron, along with the 6C and 30C potencies, helped relieve SIBO in my gut in two months. Love it, covers many symptoms. Arsenicum Album 200ck by Boiron is the best product you can have for any food poisoning, it will get rid of the symptoms almost immediately, you don't even need to go to the doctor. Easy to swallow, even when in a lot of pain, just put it under the tongue. Everybody should have this very valuable remedy in their home especially when flu season arrives: this is the best weapon against the stomach flu! 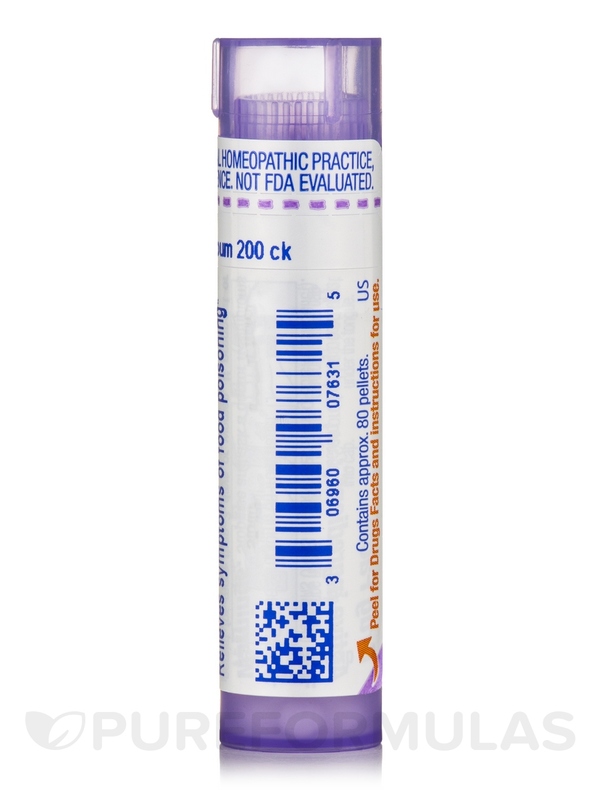 Vomiting and diarrhea with chills and irritable weakness are the symptoms indicating that this is the appropriate homeopathic remedy. Its also very useful for food poisoning.